Arrive Cochin. Transfer to Munnar. 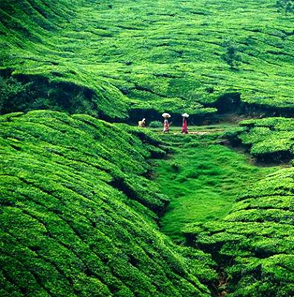 Munnar : A beautiful hill station situated at the confluence of three mountain streams around 1600 mts above sea level. This hill station was once the summer resort of the erstwhile British Government in South India and is popular for its cool climate and tea plantations. This quite little town boasts of many colonial bungalows, tea factories, wild life sanctuaries and many more. Day at Leisure to visit some of the sights mentioned below. Eravikulam National Park (15 km from Munnar) - Home of around three thousand free roaming ibex, home to the Nilgiri thar, Sambhar, Gaur, Elephant etc. Mattupetty (13 km from Munnar) - A dam at an elevation of 1700 mts, and a highly specialized diary farm and the Indo-Swiss live stock project. Devikulam (7 kms from Munnar) - Situated at a height of 1800 mts with a lovel little lake, hidden by the rolling green hills, gorgeous flora and fauna and the cool, makes a nature lover's retreat. Pallivasal (8 km from Munnar) - the venue of the first Hydro-Electric project in Kerala and a place of immense scenic beauty. Echo Point (15 km from Munnar) - This scenic place gets its name from the natural echo phenomenon here. Echo point is on the way to Top Station from Munnar. Rajamala (15 km from Munnar) - The natural habitat of the Nilgiri Tahr, Rajamala is 2695 m above sea level. Half the world's population of the rare mountain goat or tahr, which is fast becoming extinct, is now found here. The Nilgiri Tahr in Rajamala is now to be found in small herds found in Eravikulam-Rajamala region. The total number of Nilgiri Tahrs in Rajamala is estimated to be over 1300. Visitors are not allowed during the monsoon. Chitirapuram (10 km from Munnar) - With its sleepy little cottages, bungalows, old playgrounds and courts, Chithirapuram still exudes an old world charm. Home of the Pallyvasal Hydel Power Project, this hill town is also famous for its picturesque tea plantations. Breakfast at the hotel. Day at leisure to visit places not visited yesterday. Over Night Tea Valley ( Executive Room ) - Meals included : Breakfast. Depart Munnar for Thekkady. Arrive Thekkady and check into the hotel. 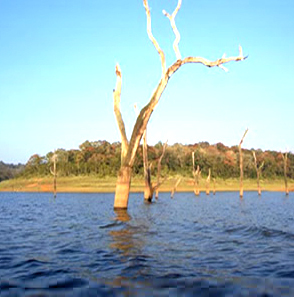 Evening game viewing cruise on the Periyar Lake. Breakfast at the resort. Transfer to the Houseboat. Check into House Boat by about 12 noon. Breakfast. 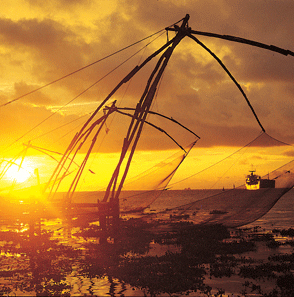 Check out and transfer to Cochin. Sightseeing tour of Cochin takes you to the Jewish section where the first emigration of Jews to Kerala is said to have taken place in the 6th Century B.C. The Jewish Synagogue in Mattancherry was built in 1568 and rebuilt in 1664 with Chinese willow-patterned tiles and gold crowns and has ancient scrolls. Visit the Dutch Palace built by the Portuguese in 1510 and later taken over by the Dutch. See St. Francis Church, the first European Church in India, where Vasco Da Gama was buried until his remains were taken back to Portugal and the Chinese fishing nets named after the country of their origin. Daily Breakfast at the Hotels. Any Entrances, Monument fees, Guides.